Single lane folder and stacker for mixed size towels. Provides one, two, and thirding folds together with additional crossfold. Single lane, Autograding French Folder, and Stacker for towels. 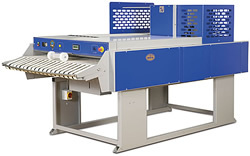 Single lane automatic folder and stacker for small pieces such as terry towels & bathmats etc. Selectable edges in or edges out facility. Single lane folder for blankets, large towels etc. Three primary and two crossfolds available.